What is the R-22 Phase Out? All of your air conditioning systems currectly use R-22 refrigerant (freon). This has been the standard for over 50 years. The EPA has mandated the phase-out of all air conditioning units using R-22 freon. This means that there are no more R-22 freon unites being manufactured. The current inventory of the R-22 unit is almost depleted. The new unites are using the new EPA approved 410A freon. This freon for the largest part will not work in the existing R-22 units. -This mainly affects the split systems that are comprised of a condensing unit and an air handler. -If you need a new condensing unit, it will have to be a 410A freon unit. The problem is that most of the existing R-22 freon air handlers will not operate with the new 410A freon condensing units. -Some of the existing air handlers will be able to be retrofitted to operate with the new 410A freon condensing units. This will be a case-by-case situation. -If you need a new air handler that has an R-22 freon condensing unit, we can retrofit a 410A freon air handler to match the existing R-22 freon condensing unit. -The worst case scenario is that you need a new condensing unit and the air handler cannot be retrofitted, you will have to replace the air handler and the condensing unit to a new 410A system. This is going to be an increase of cost to our customers. It is our job to prepare you for the additional cost that will be incurred with the new EPA ruling. 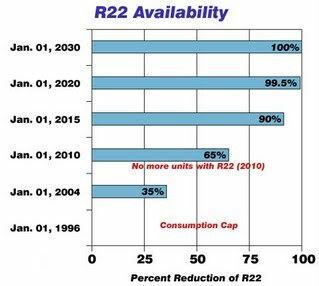 The actual R-22 freon will be available for the existing R-22 systems for a few more years. This means that if you have a freon leak we can still provide the freon for the existing R-22 systems.